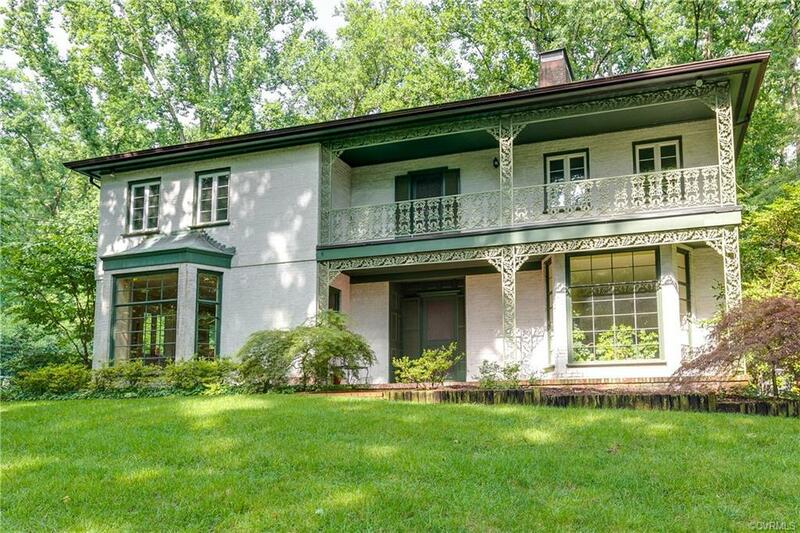 New Orleans meets Richmond in this ARCHITECTURAL GEM in Stratford Hills! RARE OPPORTUNITY to purchase an AMAZING CANVAS TO MAKE YOUR OWN…whatever your taste the possibilities are endless! Walk to the James River! CENTRAL LOCATION is just minutes from new Publix, Willow Oaks Country Club, Stony Point Mall, Powhite Parkway access, private schools, CCV, Carytown, Fan/Museum, Downtown! Perched on a hill in a lush, green, manicured setting this UNIQUE ALL BRICK HOME offers tremendous curb appeal with double front porch flanked by gorgeous floor to ceiling bay windows. Formal living w/ fireplace, formal dining, private office w/ fireplace, kitchen, 1/2 bath, family room w/ French doors & built ins & office nook w/picture window overlooking the private backyard make up the first floor. Master suite, 2nd floor laundry, 2 additional bedrooms, additional full bath, & large porch complete the 2nd floor. Wood floors & plentiful windows throughout the entire house let light & nature in. Basement w/ added full bath, storage, & flex room w/ private entrance (potential 4th bed or entertainment room). Outbuilding would make a great man/woman cave, artist studio, guest cottage, or more storage! Directions: Chippenham Pkway To Right On Kenmore Road To Right On Marilea Road To Left On Custis Road (Name Changes To Shirley Road) Then Bear Left Onto Custis Road.